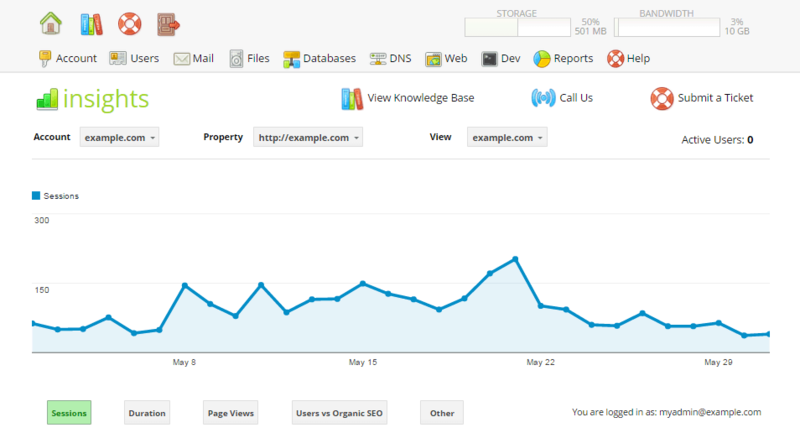 Hosting platforms v5+ support easy integration of Google Analytics into your Dashboard. Analytics provide a bevvy of useful metrics including unique visitor count, visitor behavior, SEO efficacy, goal targeting, and browser usage. Analytics requires setup within Google Code and the control panel. Prerequisite: Google Analytics must be setup before completing this. See KB: Enabling Google Analytics support. 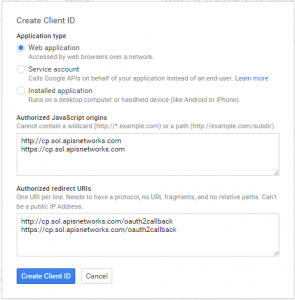 Login to Google Code API Console using your Google account. Go to APIs & Auth > Credentials to create a new OAuth Client ID. Click on Create new Client ID to generate a new API ID. This will be used in the control panel to access Analytics. Copy the Client ID value generated. This will be used later under Configuring within the control panel. 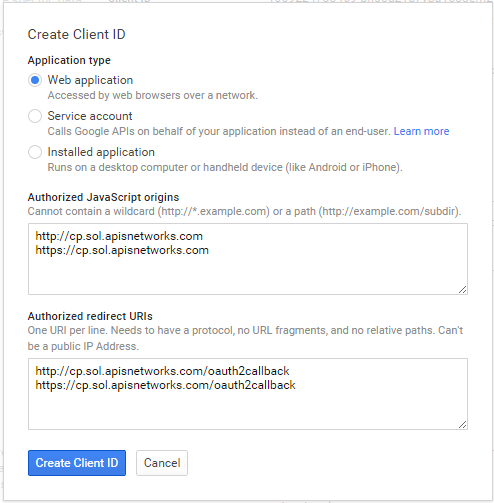 Sample client ID generated within Google’s API console. Client ID masked for security. 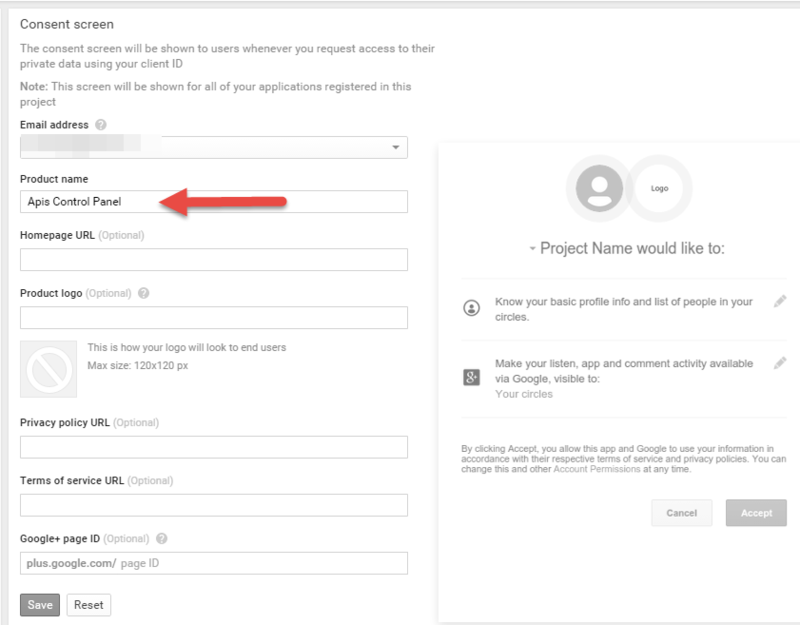 Authorize control panel access to the Analytics API via APIs & Auth > APIs. Under API Library, search for “Analytics API“. Click on Enable API if it is not enabled on your account. Enable API button to enable Analytics data sharing within the control panel. Visit Account > Settings. 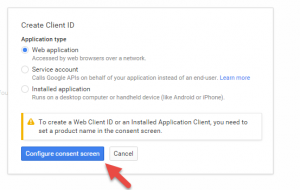 Under Control Panel enter the Client ID generated in the above section into Google Analytics API Key. Click the Edit action to edit the domain or subdomain to add integration. Click Add Directive to expand the directive dialog. Sample input configuring your Analytics ID. Go back to Account > Dashboard. 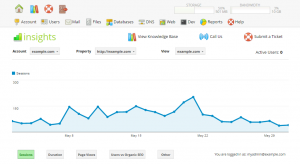 Click Access Google Analytics button to authenticate. 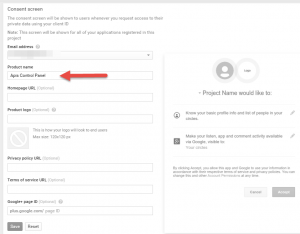 Access Google Analytics button to sign-on and begin sharing data with the control panel. Refresh the page. Statistics will load. If statistics fail to load, ensure Analytics API has been enabled (see previous section). Visit Account > Settings > Control Panel section > Google Analytics API Key > Delete to remove API key access. This will also disable integrated Analytics. Analytics only works on well-formed HTML pages. Raw files are never reflected in byte usage. For example, linking to a file directly, such as the 100 MB test file, is never reflected in usage (click as much as you’d like! it is not reflected in Google Analytics usage). However, loading an image, such as the logo or control panel sample image on apnscp.com, inline as part of a web page is reflected. This discrepancy occurs because Analytics must include itself in valid HTML. Sending a raw file precludes bootstrapping by lack of a HTML document. This entry was posted in Control Panel and tagged control panel, pagespeed, stats.